When people refer to “traditional” or “standard” blackjack, American and European blackjack are the two default “vanilla” variations of the game, and probably the most classic we can get when it comes to playing a good old-fashioned game of 21. American and European Blackjack share the same main objective with all other types of blackjack: beat the dealer by acquiring a hand on 21 or as close to 21 as possible without exceeding it to avoid busting and ultimately losing. The key difference between the two variants is one card. It is a seemingly minor thing, but new players or casual visitors of the casino tables need to recognise the significance of the hole card, how it can change the experience and how it changes all the sub-variations based on both American and European 21. In games of 21 following traditional American rules, the dealer receives one card face up and one card face down. If the dealer happens to have an Ace as his or her upcard, they then immediately peek at their hole card. If their hole card is a 10-point card or a face card (Jack, Queen, King), the dealer has a blackjack and the hand ends before it really begins, with all players losing their wagers. In games following European rules, the dealer receives only one card — the second card is only dealt once all players on the table have finalised their decisions and have stood or otherwise busted. Therefore, this is why European rules or games without a hole card or called No Hole Card games (NHC). Because there is no hole card, an immediate check for dealer blackjack is not possible. The disadvantage of this is that you have less of an idea of what cards the dealer has. American hole card rules are slightly more advantageous for players because a dealer’s blackjack can be revealed before we even have the chance to make further moves — doubling down, splitting, and so on. This means we can be less conservative and more aggressive when it comes to doubling, splitting our bets or committing to side bets because we know at the beginning of the hand if the dealer has an immediate winning hand or not. The hole card rule also means we can indirectly be prevented from increasing our bets and losing more than our initial bet, which is always a good thing. Finally, with American hole card rules, we can place insurance bets with aa Ace upcard and find out if we get paid out from a dealer blackjack almost immediately; if we lose, our side wager is lost and the hand continues as normal and if we win, our initial wager is wiped but our 2 to 1 insurance bet is paid out. American Blackjack is comprised of several subtypes of 21 created within the country rather than being its own standalone variation: Atlantic City Blackjack, Double Attack Blackjack, Spanish 21, Super Fun 21 and Vegas Strip Blackjack are some of the most prominent and popular versions played across the world in live casinos and online. There are some brick and mortar casinos and online casino sites which offer up games of ‘vanilla’ American Blackjack, but these are rare and most games usually incorporate their own unique side bets, minor rule changes or otherwise follow the subtypes above. American Blackjack variations usually employ similar rules with minor changes between them. Six to eight standard decks of cards with a shoe. 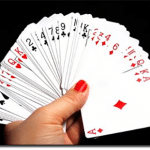 Hole card games — dealer peeks for blackjack on 10s and Ace upcards. We can split Aces only once, and only take one card to split Aces. Some American variations, such as Double Attack Blackjack and Super Fun 21 are extremely different from the standard template and use either Spanish decks with 48 cards (the four 10s are removed) or one to six standard decks with player-friendly rules and extremely altered payouts. American Blackjack offers a decent house edge compared to other standard types of blackjack, attributable to its player friendly rules, such as doubling on any hand total or being able to take up late surrender. What counters most of these favourable rules is the larger decks used — six or eight, as standard — which increases the house edge considerably and makes it harder for card counters to exploit or for the always coveted “Ace rich decks” from randomly occurring. Late Surrender is allowed — decreases house edge by 0.08%. Double on any hand total is allowed — decreases house edge by 0.23%. Double after splitting allowed — decreases house edge by 0.14%. Double Down Rescue — decreases house edge by 0.10%. Resplit Aces — decreases house edge by 0.08%. Six or eight decks — increases house edge by 0.64% or 0.65% respectively. 6 to 5 payout — increases house edge by 1.39%. Dealer hits on Soft 17 – increases house edge by 0.22%. In American Blackjack, the payout for a blackjack hand is mostly 3 to 2 odds, but an unfavourable trend of 6 to 5 payouts are common in American casinos, both land-based and online. Avoid the latter whenever possible as it increases the house edge dramatically and isn’t worth your time when there are plenty of games out there with the fair and standard 3 to 2, or even the more sought after 2 to 1 payouts for blackjack. All other winning hands are paid out at even money, at 1 to 1 odds. A winning insurance side bet, when offered, pays out at 2 to 1 odds. European Blackjack is one of the most common version of blackjack played across the world, both in live casinos and on the Internet. It has retained widespread popularity due its lower decks used compared to other 21 variations. The game is played with two standard 52-card decks but there are some games which have more or less. In any card game, the fewer decks, the lower the house advantage. Unlike other types of 21, European Blackjack’s rules are mostly fixed across all casinos. This type of consistency is great for players who don’t want to worry about small variations in every game they seek. The following are the standard rules in place across the European blackjack games. European Blackjack always uses double decks with a shoe. Blackjack payout is fixed at the usual 3 to 2 odds. We may only double down on a hard hand of nine, 10 or 11. We may not double if we split our hand. Insurance is available when the dealer’s upcard is an Ace. Insurance side wagers are paid out only after the main hand is played. 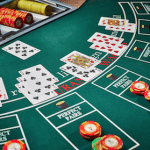 European Blackjack offers a comparable house edge to other standard types of blackjack. It is viewed as favourable by many players on account of being played with two decks rather than six or eight and for players who are adept at mentally counting cards, the low number of decks is especially ideal to keep track of remaining cards a lot more easily. However, as most games with fewer decks, the house enforces a variety of unfavourable rules to offset this advantage. Double decks — decreases house edge by 0.19%. Dealer stands on Soft 17 — decreases house edge by 0.22%. No Ace resplits — increases house edge by 0.18%. Can only double on a hand total of nine, 10 or 11 — increases house edge by 0.09%. No double after splitting — increases house edge by 0.14%. No Hole Card Game (NHC) — increases house edge by 0.11%. In European Blackjack, the payout for a blackjack hand is fixed at 3 to 2 odds, which is a good thing to know considering the inconsistency in payouts that plague American variations. American Blackjack’s rules are easily more player-friendly and flexible when it comes to the play options available. We can surrender when our hand is not ideal, we can double down on any hand and we can split hands with little restrictions. Easily the most beneficial rule difference is the inclusion of the hole card: as detailed above, dealers in American blackjack peek for a natural blackjack before players make any wagers, indirectly preventing us from wasting more money on double downs or splits and allowing us to play more aggressively, with more confidence behind each move. European Blackjack is still a very fun game, despite its counterpart’s clear advantages. Its use of a double deck lowers the house edge and is a lot more attractive for adept card counters, and “Ace rich” decks are a lot more common in double decks as there’s more chance for high concentrations to randomly occur. However, card counters beware: some games use an automatic shuffler after each round of play. This is the worst nightmare for card counters, as it can make keeping a good estimate and count of each practically impossible. No matter which version you play, enjoy the game, recognise the differences and play to their strengths and weaknesses. In the long-term, though, we recommend playing American Blackjack for better chances at winning.